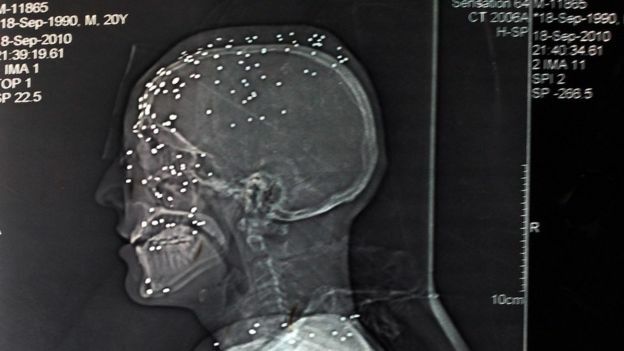 ∼ A 22-year-old woman who was caught in crossfire and hit by pellets, and lost her vision. ∼ A father whose child was injured by pellets. ∼ A doctor who attended to the injured. X-ray of a more serious “pellet gun,” or 12 gauge shotgun, injury in Kashmir. The year 2016 witnessed renewed protests in the Kashmir Valley. There was an outpouring of people – the young and the old, women, men and even children – on the streets of the Valley. The military, paramilitary and police resorted to the use of pellet guns, allegedly to control the protestors and disperse crowds that gathered day after day, justifying their use as necessary to counter the stones flung by protestors. The irreparable consequences of this force used over several months was there for all to see; the sheer magnitude of the injuries were unraveled to those outside Kashmir through multiple media reports. Eighty people were reported to have died and more than 10,000 reported to have been injured by the pellet guns. This commentary draws on my visit to one of the affected districts at the end of 2016. I had the opportunity to visit the Valley to look into some public health programmes in the region. During the interactions with healthcare providers, the injuries from pellet guns came up as an issue of concern. Some of the staff talked about the conditions under which they had to treat the serious injuries and address permanent disabilities and blinding, particularly of children and young people. Narratives about a healthcare system under tremendous pressure, and yet trying its best to attend to the overwhelming numbers of injuries and death, touched me deeply. What my first-hand interactions with the healthcare providers and a few families brought out was that the use of pellet guns on protesters is a public health concern, as much as it is a human rights issue. “In the last four months, more than 5,000-6,000 adults and children have been injured,” a doctor told me. The healthcare system was evidently under tremendous pressure. Healthcare providers – health officials, medical officers/doctors, nurses and paramedical staff – talked about the difficult conditions under which they had to provide care for the overwhelming number of Kashmiri civilians, particularly children and young people, who were brought to health facilities in emergency situations. “Children as young as four and five years had multiple pellets in their retinas, blinding them partially or completely, for life. We operated in shifts round the clock. Many patients lost their vision,” said another doctor. These patients are brought to hospitals with serious injuries, including blinding and other permanent disabilities caused by the pellets. Amputations, permanent disabilities and the loss of life affected thousands who occupied the streets and were often not in any way engaged in the conflict. Even those on the sidelines or watching the confrontations from their homes as mere observers were hit by pellets. “My child had nothing to do with the protests. He was just standing and looking outside and he got hit with the pellets,” said a father whose son suffered injuries. In July 2016, the Jammu and Kashmir High Court Bar Association had filed a petition seeking a ban on the use of pellet guns by the security forces. However, the high court in its decision in September 2016, declined to ban pellet guns, justifying the use of force by security agencies as “inevitable” while dealing with protesters who take to violence. The court also clarified its disinclination to prohibit use of pellet guns till the expert committee constituted by the Union government to explore an alternative to pellet guns filed its report. The court instead directed health authorities to provide adequate treatment – something that was beyond the scope of several healthcare facilities. 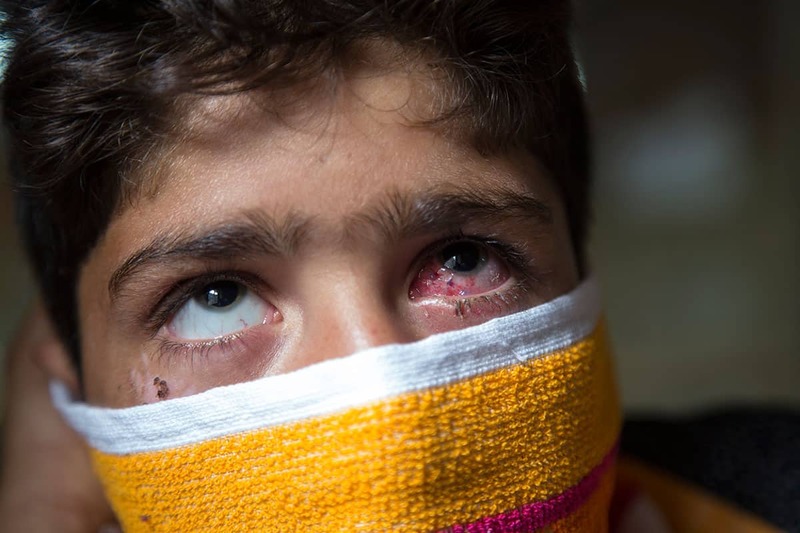 “It was shocking to see such deep posterior injuries… we do not have the infrastructure and facilities to take care of posterior surgeries, so we had to refer them to Srinagar. We tried our best to avoid further neural damage and gave them antibiotics if there was a dural penetration. The surgeries were very complex,” said an eye specialist. The Union government stated that there cannot be a complete withdrawal of the use of pellet guns in the Valley, and merely suggested that softer material like polymer, soft plastic, rubber and even paper could be used instead of the pellets. The Jammu and Kashmir High Court Bar Association then appealed in the Supreme Court. In the proceedings of this case, the latter demanded an assurance from the Union government that the pellet guns won’t be used ‘indiscriminately’ and ‘excessively’ against the people of Kashmir. The Supreme Court also sought the expert committee’s report from the government. According to some media reports, a “modified version” of pellet guns are to be used that will have a “deflector” to prevent pellets from ascending so that injuries above the waist can be avoided. These updates also indicated that several additional ‘new’ guns have been authorised. Arming security forces further and expecting that these new guns will have fewer negative consequences is highly misplaced. There is substantial literature that elaborates on how pellet guns, particularly when used at close range, can penetrate the abdomen, chest, head and eye, and cause permanent injuries or death. Apart from physiological and psychological damage, the costs of treatment, consequent disability and loss of livelihoods pose a life-long economic and social burden on the survivors. Far from being benign, non-lethal weapons as they are claimed to be, pellet guns have far-reaching health and human costs. It is surprising that despite these known long-term consequences, pellet guns are being used by the Indian security forces. The intentional use of pellets despite evidence of harm amounts to torture. Even though India has not ratified the UN Convention against Torture, as a signatory to it pellet gun usage can be qualified as torture. The International Covenant on Civil and Political Rights in its Article 7 states, “No one shall be subjected to torture or to cruel, inhuman or degrading treatment or punishment”. Accordingly, pellet gun usage is a gross violation of human rights including the rights related to life, personal freedom, livelihood and work, which are all severely curtailed. It is indefensible on the part of the government that it continues to endorse the use of pellet guns. There also exists a large volume of literature on the ethical methods of crowd control, including international standards on the use of force and firearms. All of these lay down some fundamental guidelines on dispersing unruly or violent crowds, as well as the use of “non-lethal” weapons in such situations. Exercising “restraint” seems to be the underlying principle. Before resorting to force, the people have to be warned adequately through peaceful means such as loudspeakers and banners. Even in instances when these are not successful in controlling the crowd, special precautions must be initiated to ensure that no force is unleashed on the entire crowd or bystanders. There are certain basic principles on the use of force and firearms by law enforcement officials clearly outlined in the UN Congress on the Prevention of Crime and the Treatment of Offenders. The nature of injuries in Kashmir clearly shows that none of these principles are followed. Thus the indiscriminate use of force, and in particular pellet guns by the state to control crowds, is not only a gross violation of human rights, but also a serious violation of the right to health. People in Kashmir are subjected to the fatal consequences and permanent disabilities as a result of the use of pellet guns. Not only have these guns become symbols of curtailing democratic rights, they are perceived as tools of inhuman, degrading treatment and punishment causing further fractures in an already vulnerable socio-political context. Pellet guns have singularly contributed to the loss of physical and psychological health of a substantial number of people of the state. The victims’ futures in terms of healthcare and access to other social determinants to lead meaningful lives have been severely broken. Mandates for provision of treatment for the victims of pellet gun injuries, as was done by the court, obfuscates the real issue. It merely addresses the consequences while sustaining the very cause. The news in March about the decision by State Bank of India to purchase pellet guns to guard their branches across the country shows a vehement disregard for the potential of these weapons to cause severe injuries, permanent disabilities or even death. On March 27, 2017, the Supreme Court asked the Centre to consider effective means other than use of pellet guns to quell stone pelting mobs in Jammu and Kashmir. It asserted that technology-based measures that protect both sides can be used. Whether the latest order by the apex court will be successful in putting an end to the use of pellet guns remains to be seen. Still, the use of pellet guns – or other supposedly “non-lethal” alternatives having similar capacities to injure – behoves strong opposition by all, especially the larger medical and public health community. The latter must question and challenge these tools of crowd control which inflict immense injuries and clearly contribute to the violence in the state, and therefore to the deterioration of people’s health. There cannot and must not be any justification for their use anywhere, by anyone.